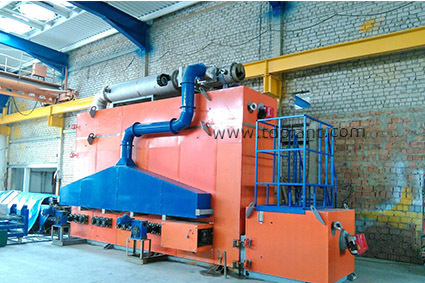 Thermolysis pipe cleaning plant, the completion of which was announced earlier, recently has been installed at the Client’s production site. This equipment specifically designed for removal of old protective paint layers and other corrosion protection coating from used pipes. Pipe cleaning is effected by thermolysis (dry low temperature pyrolysis) process, which allows removal of the old coating from all parts of metal structures, albeit non-accessible by other methods. The biggest in Ural region enterprise OAO Trubodetal (Chelyabinsk city) acted as a Customer in this Contract. The purpose of the Pipe cleaning plant is to grant the second life to used pipes and fittings. Due to no mechanical impact and comparatively low temperatures the surfaces of pipes and fittings are left intact and untouched thus suitable for further use.